HTC Corp. launched a slew of smartphones over the last year, with most of the products aimed at the budget to mid-range category. Only recently did its flagship, HTC One X, see the light of day and even that is soon going to be trumped by the HTC One X+. In the meanwhile, as is the case with every other smartphone manufacturer, HTC is trying to pack in as much as it can in a smartphone while still retaining a mid-range price on its handsets. After all, not everyone is gonna go for the Rs 40,000-plus handset every time it’s upgraded! One of the most recent ‘budget’ launches from the Taiwanese company was the HTC Desire X, an upgrade to the very popular Desire, which was released a couple of years ago. Here’s a look at how worthy an upgrade it is! It seems as if in under a year, 4-inch displays adorning smartphones have become the norm. Hence, the screen on the HTC Desire X doesn’t seem massive; it’s just the new ‘normal’. The screen is big enough for you to have your favourite, most-used apps in a 4x4 matrix. Virtual buttons that take you directly to Calls, Emails, Messages and Camera are accessible at the bottom of any homescreen. As is the launch button for all the applications that you have stored or downloaded on to the smartphone. The screen is a Super LCD with a resolution of 480x800 pixels; hence it’s definitely not the most stunning display you would have set eyes on. However, it doesn’t take away from the quintessential smartphone experience at all. HTC continues its habit of designing distinctive back panels with the Desire X as well. A blue round-edged rim runs around the camera lodged at the back of the smartphone. Against the white soft plastic body, the design is understated yet unique. Pulling the back panel out was a little more complicated than we’d expect from a seemingly well-designed phone. An awkward wedge-and-pull yanks the panel off to reveal the rather weirdly placed SIM card slot (It is lodged under the camera panel, so you slot it in from one side and push it out of the other to remove it.) You also have a microSD memory card slot next to this, which is thankfully a lot less complicated to manoeuvre. The messaging client on the HTC Desire X is pretty intuitive. Well, more than intuitive, it’s a good, quick learner. While at first go, it may not exactly suggest the word you want to type in, once you do, however, it saves your SMS vocabulary and has no trouble predicting it the next time. The keyboard wasn’t cramped either, although personally it’s just so much simpler to type messages in the landscape mode. HTC Desire X also comes with a ‘Trace keyboard’ option, which has the potential to offer stiff competition to SWYPE. As the name suggests, this virtual keyboard lets you trace your finger across letters to form words, which the handset itself predicts, and quite accurately at that. You can swipe to your left or right across the entire keyboard to access numbers, symbols or special characters. As far as pre-shoot settings go, the Camera app on the HTC Desire X offers quite a few. You can tweak the exposure levels, contrast, saturation as well as the sharpness of the image before you click it. Now, these options are accessed through a drop-down menu which takes up a lot of screen space. So, even though HTC offers a live-view of the frame while you adjust the settings, most of my subject was just masked by the in-app menu. Tweaking contrast and saturation levels made the images a little blurry as well as grainy. Without any cosmetic tweaks, the images were better than you’d expect of a regular 5-meg camera. HTC has thrown in a couple of scene modes that includes an HDR option. The shots taken with the HDF filter on weren’t dramatically different from the ones taken without the filter. The Macro mode seems to work well too except the camera overall results in slightly noisy images. Whenever I happened to take more than a shot or two of the same subject (with the Continuous Shooting mode on), the camera app automatically prompted me to choose the ‘Best Shot’ after I was done. I could browse through the series of pictures and choose the best one and the smartphone will ask you if it can just delete the rest. I think it’s a smart move, saving a lot of memory space and time which I would have spent later trying to sort through multiples of the same shot. One feature conspicuous by its absence is a front camera on the HTC Desire X, something that most people have started to take for granted in even lower-end smartphones. The rear camera gives decent results when you capture a video. However, it does not offer high-definition results. Considering most mid-range smartphones now offer 720p recording, I wonder why the HTC Desire X didn’t come with similar capabilities. One good thing about the video recorder is the fact that it starts recording as soon as you click on the video icon (it’s not a camera swap followed by another press to start recording), which saves you from a lot of time fumbling around before you can start shooting. The downside is that you can only adjust one setting during the video shoot; you can choose between having the flash on or off depending on the ambient light. The only other video settings - video quality and record with audio options – have to be chosen before you switch to the video mode. HTC Desire X runs on Android 4.0 and features an HTC Sense 4.1 overlay. HTC Sense retains some of the direct-access icons from the lock screen. So you can drag any of these four icons – Phone, Mail, Messages and Camera – on to HTC’s trademark lock ring and it’ll take you directly to the desired application. Also, HTC still leverages its motion sensor to quieten the volume once you pick the phone off your table, or switch on the speakerphone if you keep it upside down while on a call. You’ll also find the same ol’ Friend Stream, a social media widget as well as Friend Channel which lets you follow the virtual updates of just one person (stalker much?). SoundHound is packed in to make the most of the stereo powered by Beats Audio. Polaris Office, TuneIn Radio, Teeter, Google Chrome and Adobe Reader are pre-loaded to take care of your productivity and entertainment needs. During the setup, the handset prompts you to log in to your Dropbox account as well. The Dropbox integration gives you about 25GB of free online storage for two years. One problem with a series of HTC smartphones that we’ve used over time is that you are using an app, and then receive a call and eventually want to end it, the screen doesn’t take you to the in-call menu. You’ll have to swipe it down from the notification bar to end the call. 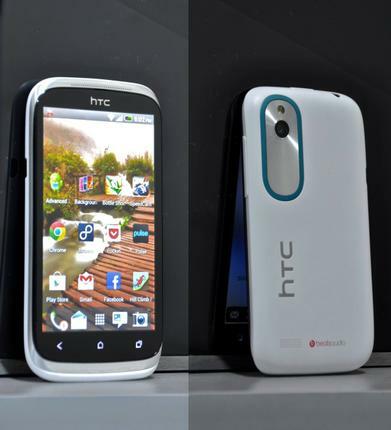 The HTC Desire X is powered by a dual-core 1GHz Qualcomm Snapdragon S4 processor, the first one to be featured in HTC phones. Some new launches such as the new Windows phone by HTC are also going to be shipped with the same processor. The handset didn’t give me reason to think it was struggling to execute applications or multitask. I switched between playing ‘Bottle Shoot’ when bored and browsing the latest stories on ‘Pulse’, while streaming music from the 8tracks app and the smartphone handled it all quite well. On our regular Quadrant Standard benchmarking test, the HTC Desire X scored about 2769 points – not a stellar performance – but managed to shoot above the likes of Motorola Atrix 4G and the Samsung Galaxy Nexus. The HTC Desire X comes with a 1,650 mAh battery and although the screen is not much of a burner, the handset did manage to last just for more than a working day. I alternated between Wi-Fi and mobile GPRS connectivity and attended to about 10 voice calls, some occasional browsing, gaming and messaging and the indicator was yet to turn red before the end of the day.